Global Manager Group leading Certification Documentation and System auditor training presentation kits selling company has launched upgrade to product C102 as EMS 14001 Awareness and Auditor training presentation kit versions 2015 from 2004. ISO 14001:2015 – Environmental Management Systems- requirements standard was published and all the existing certified companies needs to upgrade their system as per ISO 14001-2015 before September 2018 standard. Many new changes are added in this revised ISO 14001-2015 standard and focus on documents and records are reduced and now it is very much helpful to organization to improve their environment, sustainability and operational performance. The newly revised awareness and auditor training kit on ISO 14001:2015 provides more clarity and includes 6 items with our training kit. Our training kit includes more than 300 editable ppt presentation slides on 11 modules including overview, requirements, steps, documented information, objectives, awareness to vendors, environmental aspects etc. It also includes handouts, sample auditor training certificate, workshops and case study, audit record templates and more than 400 audit questions as per ISO 14001-2015. This helps any organization to make best EMS system with establishing good culture and awareness on EMS and can make it relevant to the needs of your own organization to achieve sustainable business improvements. Mr. Devang Jhaveri, Owner of Global Manager Group said that we are very happy to re-launch the product C102 EMS 14001-2015 Awareness and Auditor training kit ppt presentation, which is designed to help all world organizations and consultants to understand the requirements of ISO 14001:2015, on environmental management system. Our company has worked hard on the preparation of the ppt presentation on ISO 14001:2015, which making us the first organization that launched such training materials in a minimum time of ISO 14001-2015 EMS released. We ensure that our product C102 will help users to study the standard update and communicate clearly the message of continuous improvement with the effective Environment management system and give full value for money to user. The company associate quoted that it will be beneficial for consultants and internal auditors to improve or implement environmental management system in small and big size organizations. Ready to use EMS 14001:2015 training kit, which includes with more than 300 ppt presentation slides based on the Environment management. The full presentation kit is on sell at very compatible cost of just USD 270, and prepared in MS PowerPoint and Word documents, written in simple English, which is given with all the editing and reuse rights for any organization. 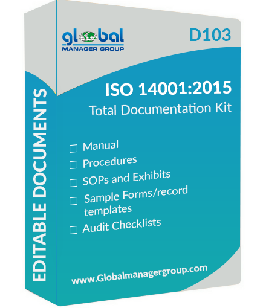 Download FREE DEMO of C102 – EMS 14001:2015 Auditor Training Kit. ISO 14001 is area of the ISO 14000 number of voluntary standards and recommendations on systems produced through the Worldwide Organization for Standardization or ISO. These standards and recommendations are written to make certain that operational processes are consistent, effective and efficient, using the organization?? ?s objectives of safeguarding and protecting the atmosphere. They answer to acquiring ISO 14001 certification may be the effective implementation of the Environmental Management System or EMS. EMS comprises an organization?? ?s programs and activities made to limit negative effect on the atmosphere although maintaining the organization?? ?s efficiency.EMS programs are handled inside a comprehensive, systematic, and recorded manner, more particularly by applying rules for creating processes, using concepts, monitoring results, and enhancing procedures. Many of these are targeted to enhance organizational procedures and considerably reduce environmental impact. To sum up EMS works as a tool for enhancing environmental performance from the organisation. It possesses a systematic method of controlling the organisation’s environment-related activities. It’s the organisation’s method of addressing short-term and long-term environmental issues. It offers order and consistency for a way the organisation responds to environmental concerns. Finally,EMS helps the organisation to pay attention to continuous improvement of their system, and perhaps to attain ISO 14001 certification. EMS is suitable for just about any organisation that wants to improve its environmental performance, notwithstanding edge against your competitors. It’s for that organisation that recognizes down to addressing environmental problems. EMS is ideal for the organisation that doesn’t understand savings over time, money along with other assets due to the deficit or lack of programs for controlling environmental matters. It is fantastic for the organisation that wishes to attain sustained compliance in relevant environmental rules, too as with achieving ISO 14001 certification. The business without environmental guidelines needs EMS. Do you know the needs of EMS? You will find four things needed for that implementation of EMS, and they’re deep commitment, proper allocation of assets, strategy planning and development, and implementation of strategy. Do you know the steps to EMS implementation? The initial step to applying EMS is orientation and commitment. This requires training from the executive management team, and performing a preliminary environmental review. The 2nd step is structure and training. This proceeds onto assigning an environmental management officer and developing management and implementation committees. The 3rd step is policy and documentation. Including developing an environmental policy statement and determining methods. The 4th step is progressive implementation. Here, an environmental management program was created and implemented, together with proper monitoring, auditing, and execution of corrective measures. The 5th and final step is ISO 14001 certification and registration. The business undergoes pre-assessment and takes corrective action, after which moves onto final certification audit by certifying body. To flourish your business, you need to have an extraordinary advantage and you can get this from an ISO certification. The ISO certificate will increase your business revenue by increasing customers and their reliability in your products and services. It will also make you stand apart from your competitors. ISO standards are enough to make a good brand reputation of your business. ISO 14001 is an internationally recognized certificate that ensures the accurate management of environmental responsibility of the organization. In ISO 14001 certification, the organization is tend to go throw through the process of environmental management system. The process is based on ?? ?plan, do, check, and then act??? methodology. This effective approach fulfils the company?? ?s responsibility towards environmental issues as well as enhances its brand reputation. Most of the customers look for organization that has an internationally recognized certificate. On the other hand, not having an internationally recognized certificate like ISO will cost you in losing your potential clients, which is not at all good for any business. Therefore, you must consider Global Manager Group that is specialized in providing ISO training as well as helping you throughout the process of getting an ISO certification. In today?? ?s era, showing your environmental consciousness by getting an ISO 14001 certification is of utmost importance, as it will make you stand apart from your competitors as well as increase the reliability of customers in your products and services. In addition, organization has to show their waste management and energy consumption system to the government authorities. However, getting an ISO 14001 signifies that you are having the potential to fulfil the requirements of the pollution control board and there will be less chances of any legal case regarding violation of environmental rules against your organization. Moreover, getting an ISO certification saves lot of time and money. The time and money that you would be wasting in employing a methodology to control the waste management and energy consumption system as well as looking out and maintaining such plans. This will also help you out in case you are planning to expand your business to further new places. Again, there will be no need of getting a special certification, as you can continue with the same ISO 14001 certification. Considering Global Manager Group for getting such ISO certification would be the smart choice. Searching for ISO requirements and then getting ISO certification could be more tedious without expert guidance. Therefore, it is always a better choice to choose an expert company providing ISO certification training and audits, as this will help you out in getting ISO 14001 or any other ISO certification at first attempt. Global Manager Group provides its service not only UK andUSA, but also inSouth Africa,London,Canada and other parts of the world, so no worries if you are from any part of the world.